Ancient Tree Of Time, originally uploaded by MarkReqs. 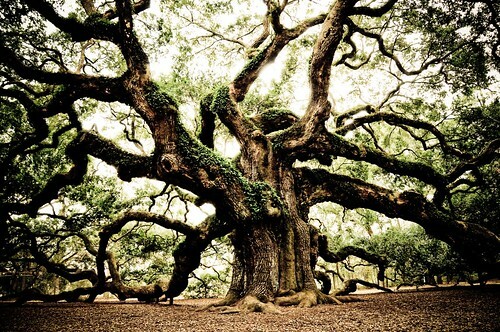 The Angel Oak is a Southern live oak tree located in Angel Oak Park, in Charleston, South Carolina on Johns Island, one of South Carolina's Sea Islands. It is estimated to be over 1400 years old, standing 20 m (65 feet) tall, 2.47 m in diameter, and the crown covers an area of 1,580 m² (17,000 square feet). Its longest limb is 27 m (89 feet) in length. The tree and surrounding park have been owned by the city of Charleston since 1991.